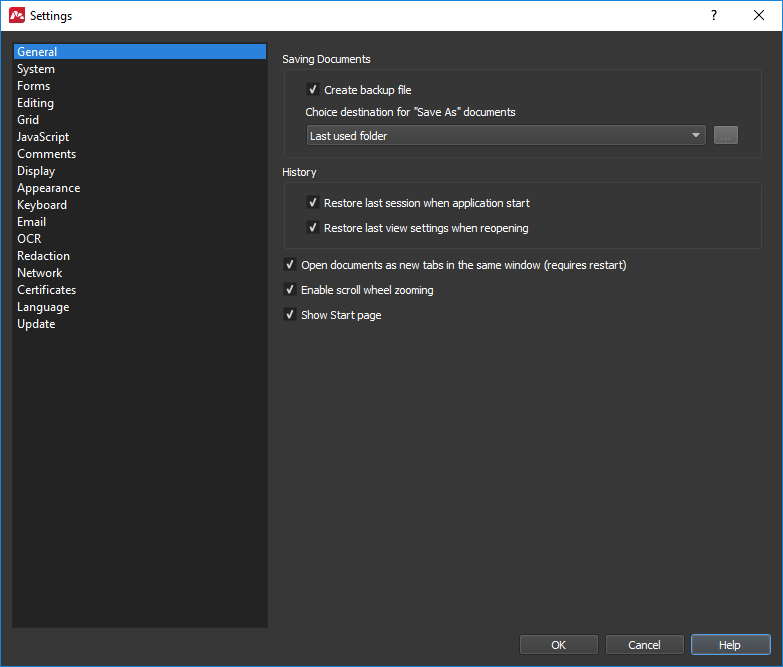 In order to open settings Master PDF Editor, choose Tools -> Settings in Main menu. Create backup file. 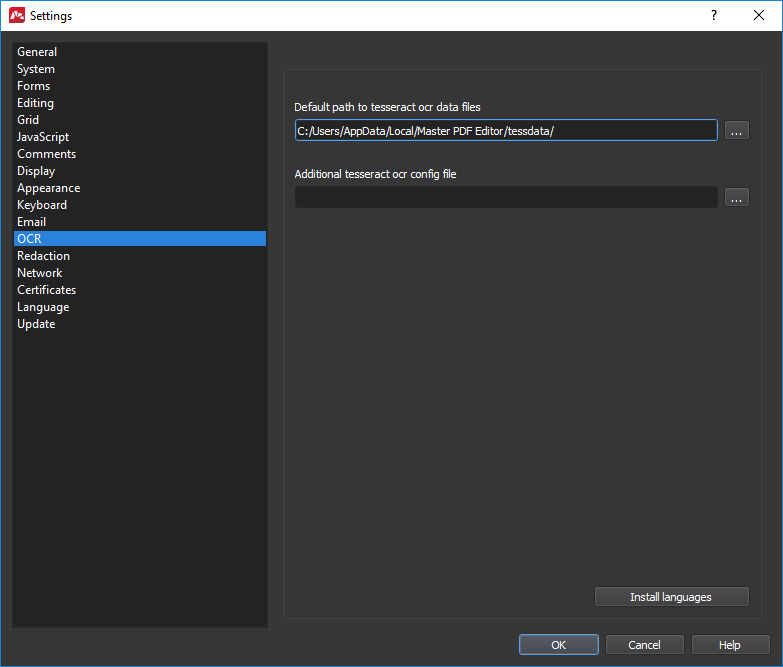 Master PDF Editor creates backup copy when saving the document. Backup is created only once. Choice destination for «Save As…» documents. Choose folder to open when saving file with «Save As…». Restore last session when application starts. Master PDF Editor saves and restores all opened documents and panels location when relaunching program. Restore last view settings when reopening. 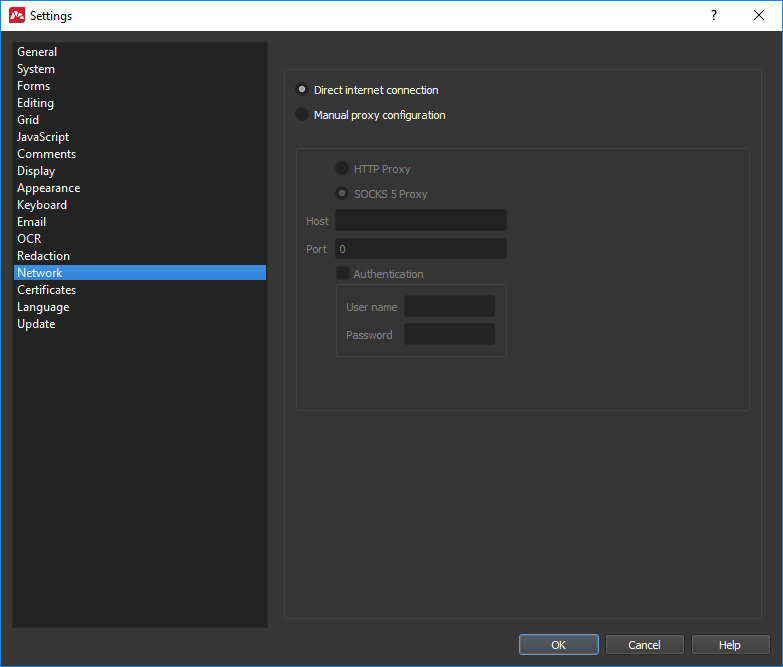 If enabled, all view settings are restored when reopening the document. Open documents as new tabs in same window (requires restart). If disabled, each PDF file will be opened as new application instance. Option is absent in macOS, because there it is set in general system preferences. Enable scroll wheel zooming. Enables/disabled zoom control with mouse wheel or touch-pad when Ctrl is pressed. Show Start page. Display start page with the list of recently opened files and most used functions. Start page is shown only when there are no documents opened. 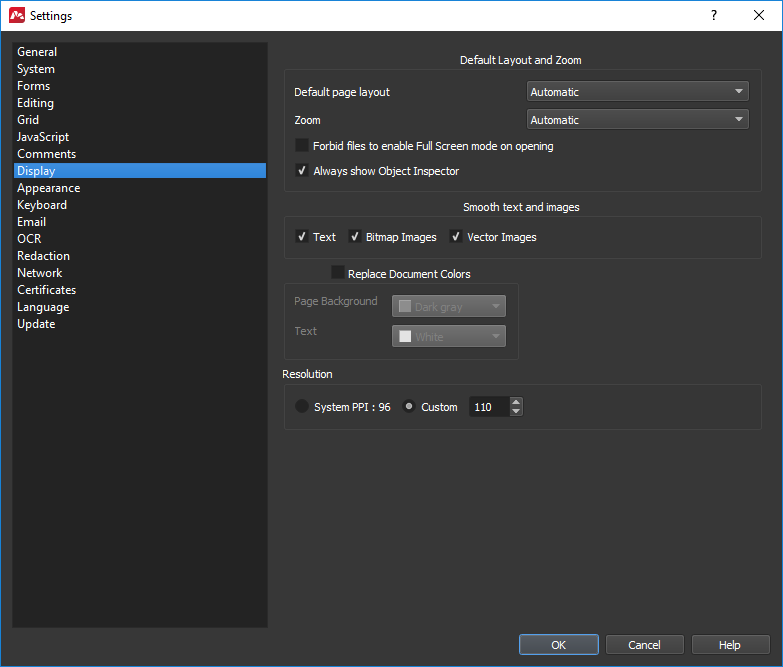 Alternative method for PDF render – Alternative way to render PDF on screen, may increase render speed up to 4 times. 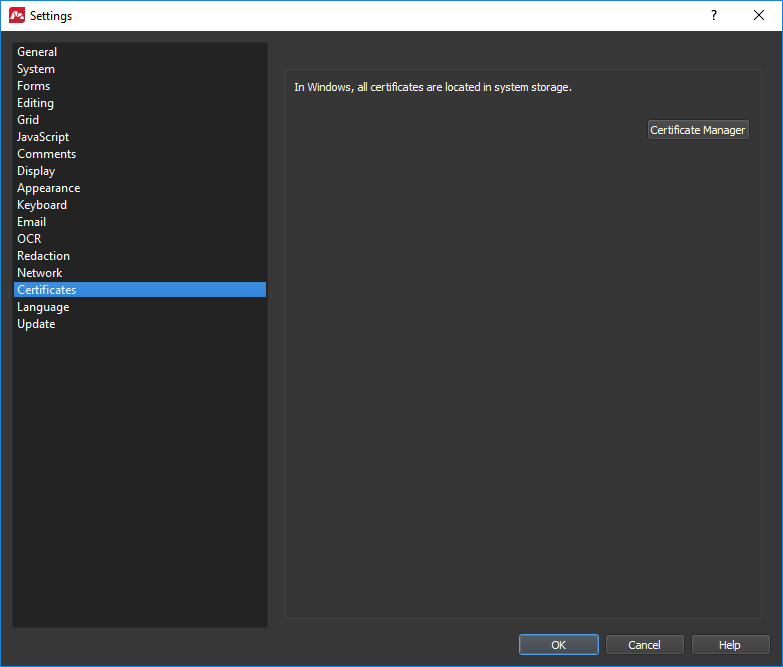 Load all objects separately – If checked (by default) all container objects will be loaded separately. This option is used for ease of editing contained objects. 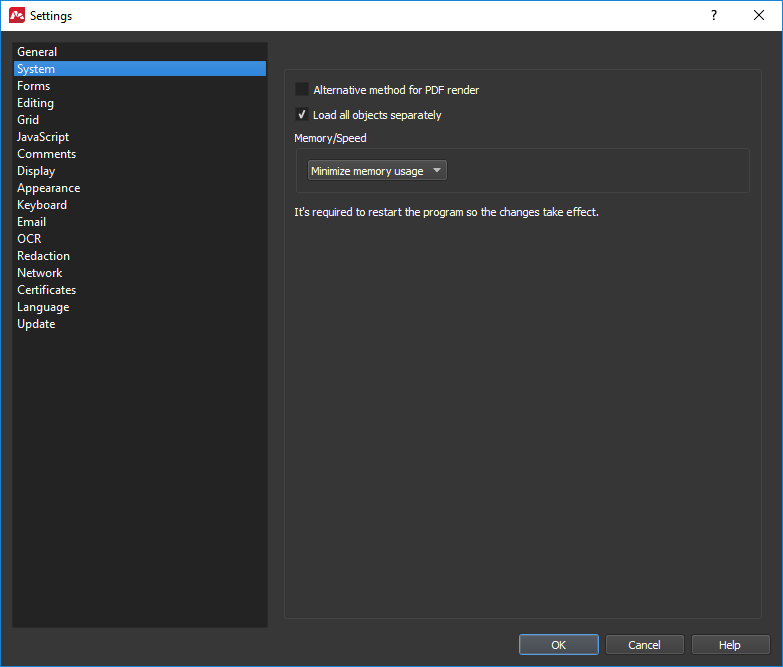 Disable this if you have issues with PDF render. Memory/Speed – Allows to preserve operative memory or increase render speed storing earlier rendered pages in cash. Highlight color. 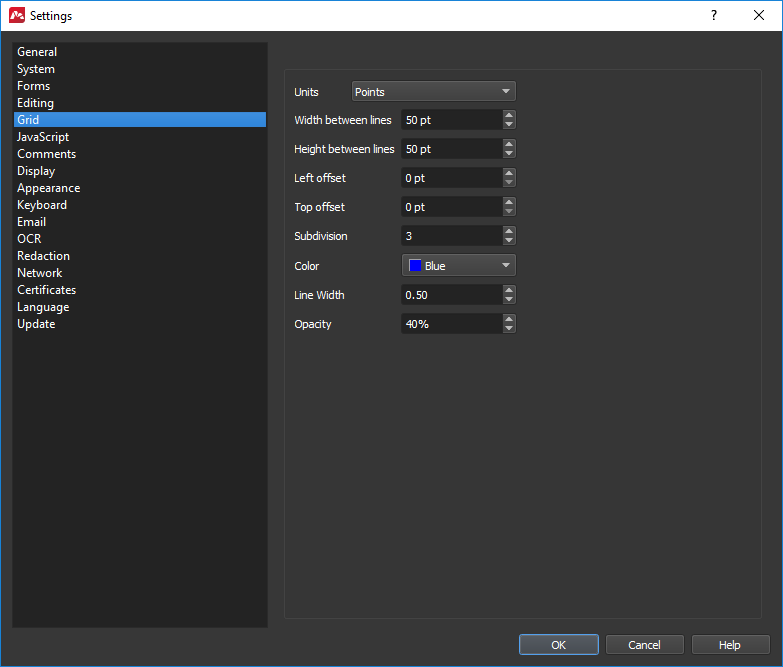 Set color for highlighted PDF forms. Required field highlight color. 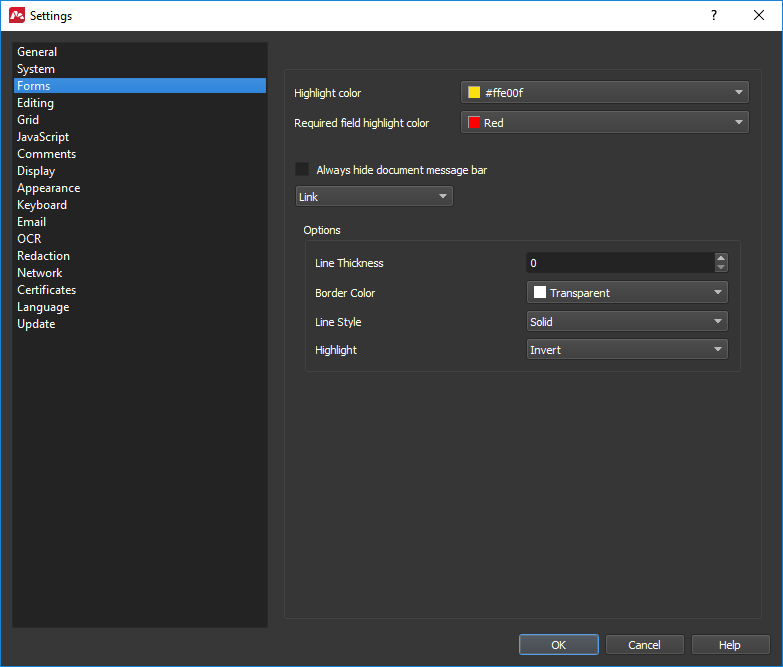 Set color for highlighted required PDF forms. Always hide document message bar. Always hide pop up message. 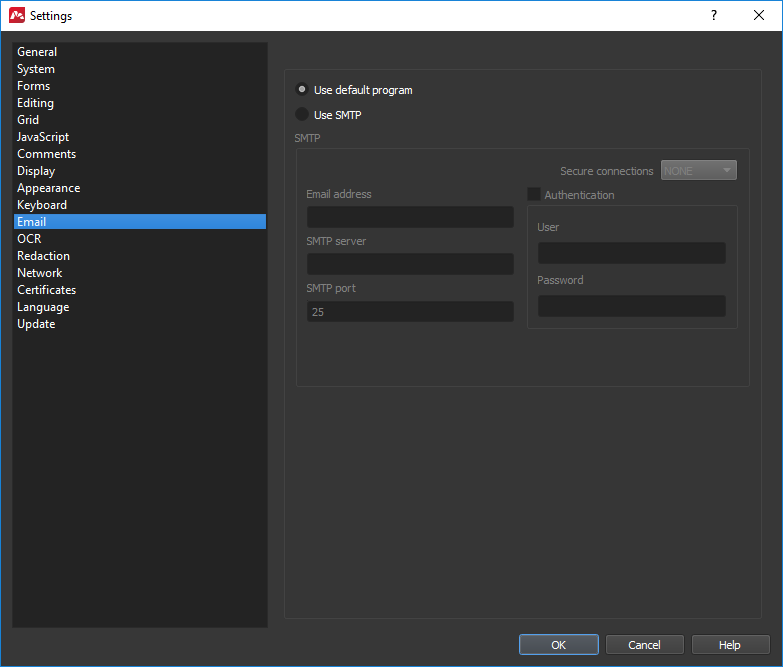 Appearance setting for created PDF forms. Use Forms -> Highlight Forms (Ctrl + H) for forms selection or forms selection reset. (For Mac OS X: Cmd+H). On this tab you also can set default settings for newly created PDF forms. Time before a move or resize starts. Time after object selection before it can be dragged or resized. Prevents random mouse dragging. Default font. 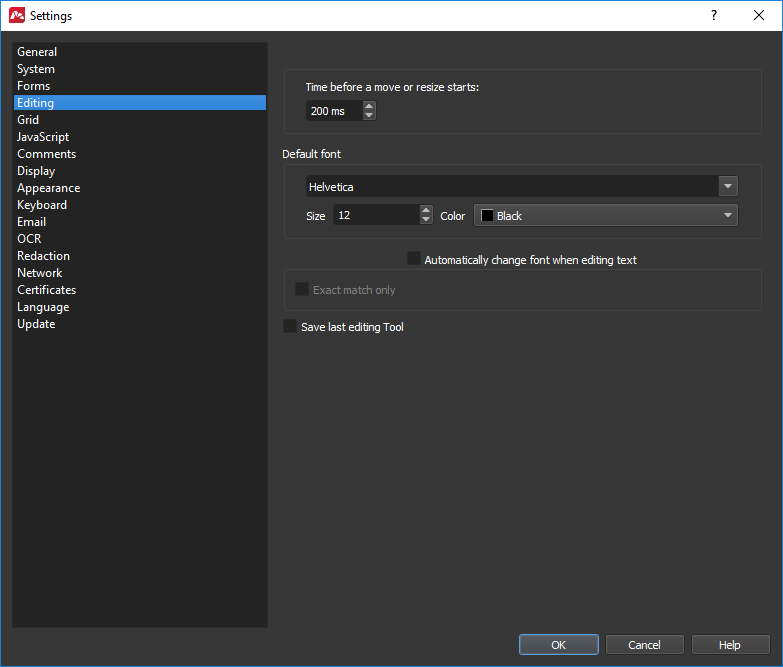 Set default font settings for application. Automatically change font when editing text. 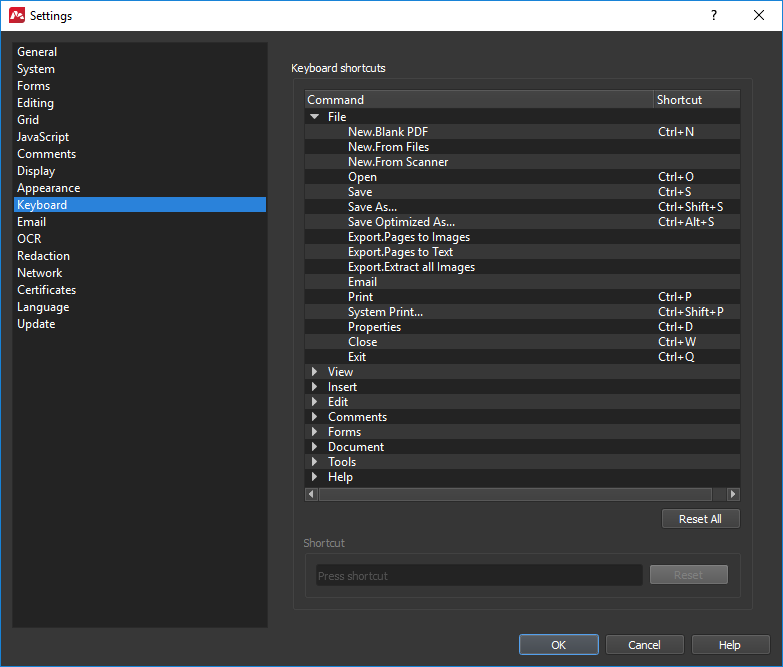 Automatic replacement of PDF font for system TTF font when editing text. Automatic replacement happens only if the application finds similar font in the system. The grid is used for more accurate objects positioning in the document. If Snap to Grid is on, the object will be automatically aligned by the closest grid line after movement. You can enable/disable this function in View -> Snap to Grid menu. The grid is displayed on screen, but not printed with the document. You can show/hide it in View -> Grid. Units. Measure units for grid size. Width between lines. Width for grid cell. Height between lines. Height for grid cell. Left offset. Value of grid offset from the left edge. Top offset. Value of grid offset from the top edge. Subdivision. Number of sub-cells inside each main cell. Lines of sub-cells are lighter than those of main cells. Color. Grid line color selection. Author. Default name is system user name. You can specify any name to set as author when creating comments. Type. Choose type of note appearance: Comment, Circle, Check Mark. Opacity. Opacity of the note. Color. Color of the note. In the right part of the window you can set preferences for following comments: text Highlight, text Underlining, text Strikethrough. To do this choose comment type in the drop-down list and set its preferences. Then choose next type and set its preferences too. Highlight Text/Strikeout Text/Underline Text/… Comment type selection. Opacity. Opacity of the comment lines. Color. Color of the comment lines. Line width. Width of underline and Strikethrough lines. Pop-up Opacity. Opacity setting of pop-up form for all comment types. Default Layout and Zoom. 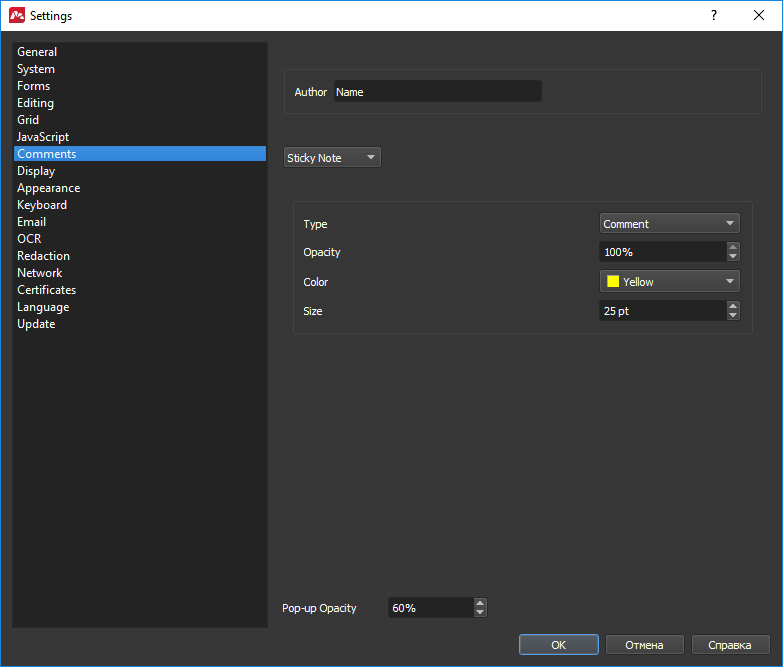 Page settings for newly opened and created PDF files. Smooth text and images. Choose objects to apply anti-aliasing. Replace Document Colors. 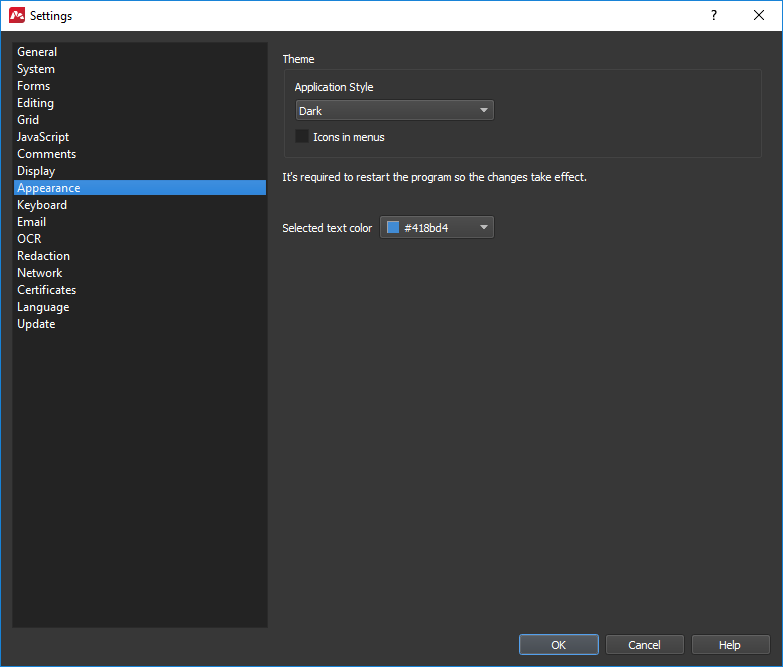 If enabled, privies possibility to change font and background color in the document. System PPI. Uses system PPI setting to display document on the monitor. Custom. Allows to set monitor resolution manually if it’s required for your work or Master PDF Editor incorrectly identified it. Application relaunch is required for settings to take effect. In Appearance tab you can set the application’s interface according to your tastes. Theme. Choose appearance theme out of the list. 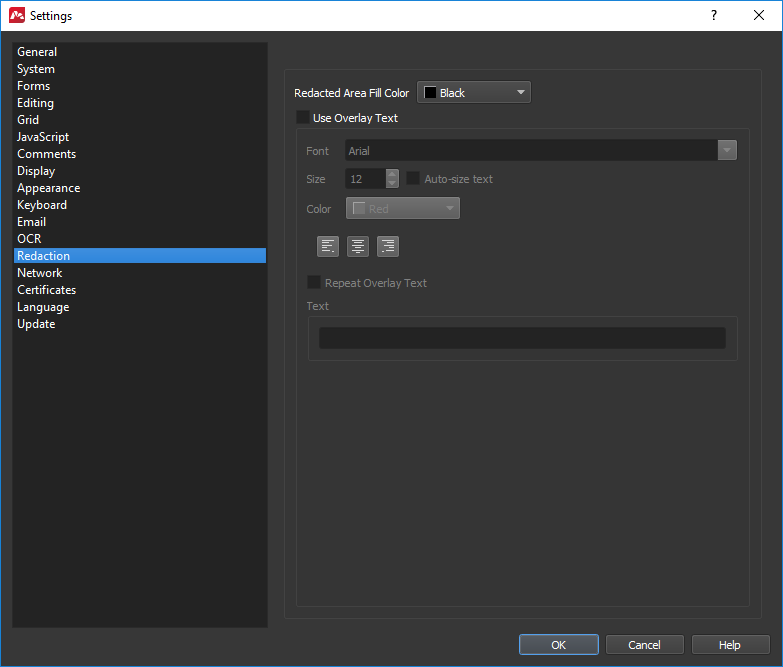 If Dark Style is enabled, then Fusion Style only is available. Icons in menus. Set/remove flag to show/hide icons in main menu. This option doesn’t work for some Linux desktop environments, for example Unity. Selected text color. Choose color of the selected text. 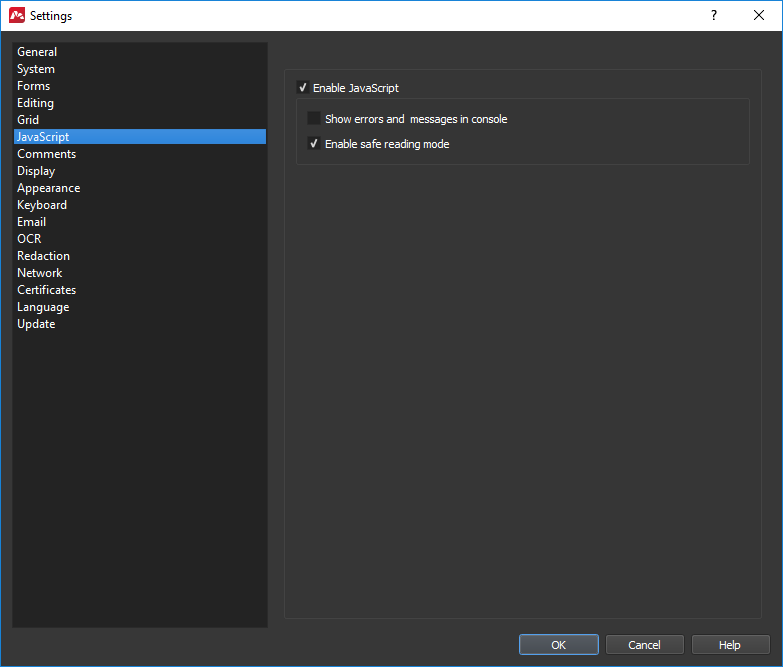 Email delivery settings for Master PDF Editor. Use default program. Launches email client, set as default in your system. Use SMTP. The block contains basic settings for SMTP server like address, port, user name and password. These settings are required for email delivery. If you don’t know how to fill these fields, contact your system administrator. Master PDF Editor has the functionality of optical character recognition for PDF files, containing image (for example, scanned documents converted to PDF). This functionality enables you to search, fix and copy text in such PDF documents. Default path to tesseract ocr data files. This setting provides a possibility to set same folder for several users. Mostly used on servers. Additional tesseract ocr config file. Required for deliberate configuration tesseract ocr. Consult user manual to find out more info about tesseract ocr. Install languages. Choose languages for text recognition. Look here for additional info. Allows to set up Internet connection. If you don’t know required options, contact system administrator. Settings for Certificates. Read more about Certificate Manager in Linux. On this tab you can change interface language for Master PDF Editor. Set frequency for automatic update check. You can set to check never, weekly or monthly. In order to check for updates manually choose Help > Check for update in Main menu.